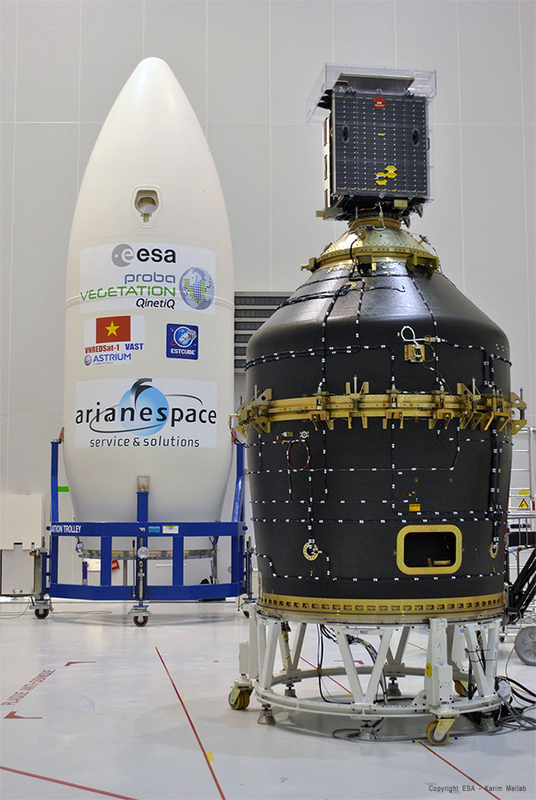 ESA report the payload “stack” for Vega’s second mission from has been completed and is ready for the planned launch from Kourou on May 2. After its deployment by Vega on the upcoming flight, Proba-V will begin the satellite’s mission of mapping land cover and vegetation growth across the Earth every two days. The miniaturized ESA satellite is to provide data for the instrument’s worldwide scientific user community and service providers once its in-orbit commissioning is completed. Proba-V was produced by prime contractor QinetiQ Space Belgium and carries a new, advanced version of the Vegetation instrument – the latest in a series already deployed on France’s full-sized Spot-4 and Spot-5 satellites, which have been observing the planet since 1998 after their launches by Arianespace. The Astrium-built VNREDSat-1 will support the Vietnamese government’s initiative to create an infrastructure enabling better studies of climate change effects, improving predictions for natural disasters and optimizing the country’s natural resource management. It was built on behalf of the Vietnam Academy of Science and Technology. ESTCube-1 is to test electric solar wind sail technologies and help establish an Estonian infrastructure for future space projects. This satellite was produced in a collaboration of students from Tartu University, Estonian Aviation Academy, Tallinn University of Technology and University of Life Sciences – and developed in conjunction with the Finnish Meteorological Institute and the German Space Center (DLR). Once in orbit, ESTCube-1 will deploy a small conductive tether which is to be electrically charged to 500 Volts using electron guns contained within the 10 x 10 x 10-cm. cubesat.